Pahrump, Nevada - Experience The Endless Beauty of the Great Outdoors. 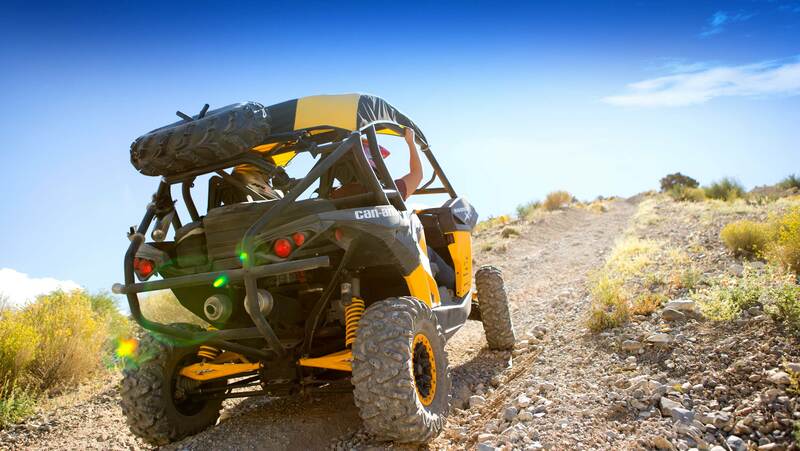 Scenic views, exceptional weather, and epic adventure trails make Pahrump a thrill-seeker’s dream come true. This desert hideaway is a popular travel destination for hikers, mountain bikers, rock climbers and off-roaders of all skill levels. 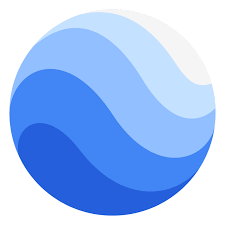 Install the Google Earth browser plugin to interactively explore local trails below. Visit the Nevada Off-Highway Vehicle Commission for additional information. To learn more about Nye County OHV laws and rules, visit Nye County Sheriff’s Office OHV Site. Listed below are some of our favorite trails for mountain biking, ATVs and off-road vehicles. 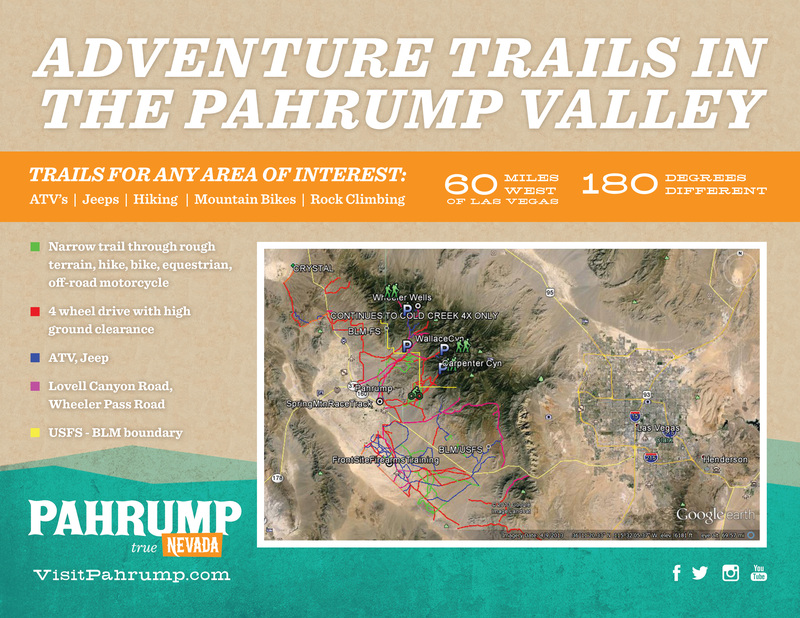 There are so many trails in and nearby Pahrump; we can’t possibly include them all. Carpenter Canyon Road, Wallace Canyon Road, and Wheeler Wash are great trails for beginners and intermediate mountain bikers, ATVs and off-road vehicles. There are also challenging double-track trails between the canyons for ATVs. Off-road vehicles love Carpenter Canyon! Confident drivers will enjoy this challenging double-track through the trees with awesome break out views of the Pahrump Valley below, and peaks of the Spring Mountains above. Hiking trails start at Carpenter Canyon unimproved campgrounds, accessible by 4×4 or two-wheel drive, with good ground clearance. A few miles of easy hiking gradually turns extreme with a steep ascent to Mt. Charleston. Wallace Canyon offers an easy foot path and plenty of parking. Mt. Charleston can also be reached from Wallace. Wheeler Wells and the historic charcoal kilns are accessible by most 2WD vehicles, even pulling small travel trailers. Hiking trailheads are at both sites. Wheeler Pass Indian Springs on US 95 is a favorite of experienced 4×4 drivers. Enjoy the cool mountain breezes, fresh air and all-around scenic beauty of Mt. Charleston. A quick 35-minute drive northwest of Las Vegas, Mt. Charleston features more than 50 miles of marked trails over the rocky terrain. From paved and dirt trails to strenuous climbs, hikers and mountain bikers of all ages and abilities will love the beautiful views and cooler temperatures at the top of the mountain. Mt. Charleston is also a great area for skiing, picnicking and camping. The Elk Meadows Trails is a network of narrow, challenging paths that are sure to entertain experienced bikers. Be sure to share the path with deer and elk who sometimes wander along these trails. Drive the 13-mile loop around the Red Rock Canyon National Conservation Area and enjoy sightseeing, vistas and overlooks from the comfort of your seat. Or if the thrill of adventure is more your speed, explore nearly 20 different day hikes through the wilderness and natural springs. To learn more about tours and sightseeing near Pahrump, contact us. We’ll help you plan your adventure.